Hey guys, I got busy with the holidays and stuff but haven't forgotten about this. I've uploaded some models I know for sure I've completed. 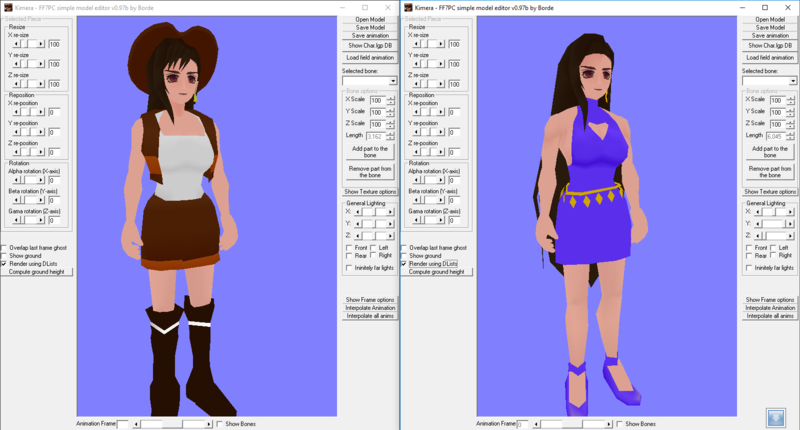 The other models I was working on all need other tweaks and I don't have the time to sort them. Hopefully this is of some use to DLPB and Kal. I'll upload more soon. Excellent. Keep them coming. When I get chance I will give them a good look too. I'll also get you a picture of what Rufus (ALAD) looks like, because I remember it being really odd. Check them over if you like, they are all working and compiled in Kimera on my end. Just got another one together. i've not try sorry the characters seeming good before but i don't know if you have a fix for hojo at the table and after also like some characters rising ,down during the scenes? If the errors in the models are simply due to placement, then it's best to correct the error properly with Makou reactor and Ochu (change the coords). I'm not sure if that's the case here. It's not. The new models are obviously taller, so the animation places them inside the ground. This looks very stupid on some fields, because you'd have a character's foot sticking out from under a background layer or something equally ridiculous. Therefore, each and every animation needs to be adjusted to place the skeleton root at the proper height, so that not even a pixel goes inside the ground plane. The problem is, some animations have been adjusted for the new models, and the majority aren't. This is why there are models bouncing up and down when they're switching anims. As for Hojo's case, I'm pretty sure I have posted an archive in the past that has the corrected animations? You did. The Hojo issue is fixed in The Reunion. Yes, I have some foggy memories on that. 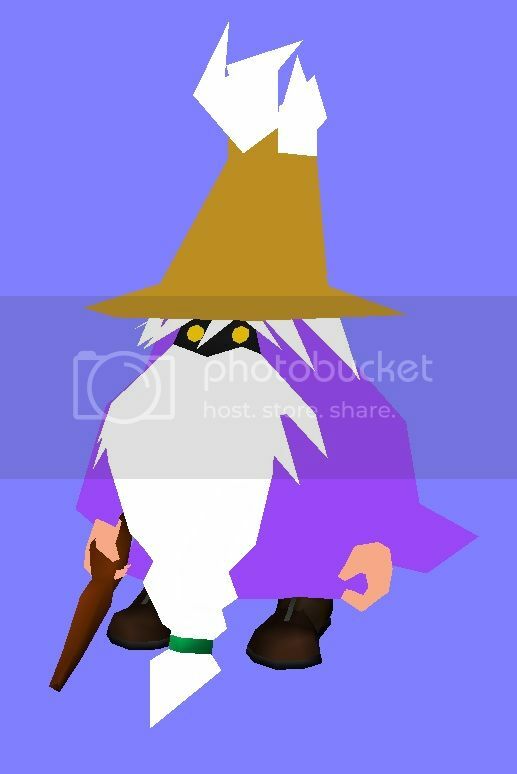 Hi, possibly stupid question, are these the models included in Final Heaven? 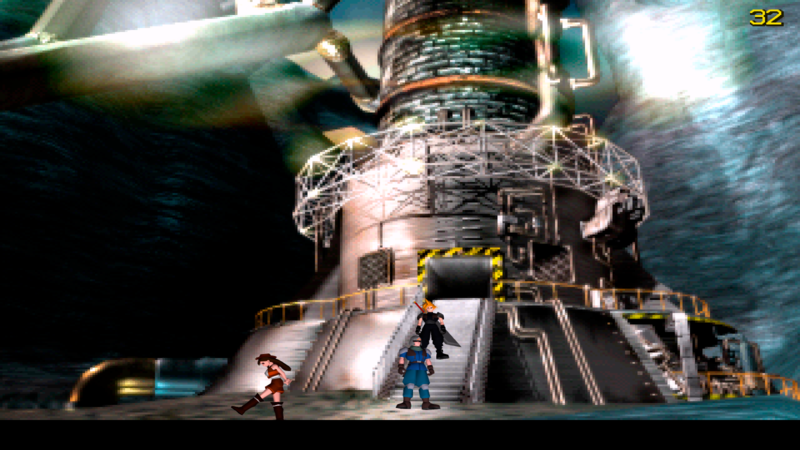 I was wondering because I found the FFVII mod page on Nexus and people are wondering what it looks like. If these are the ones included in Final Heaven do you mind if I upload some screenshots there? 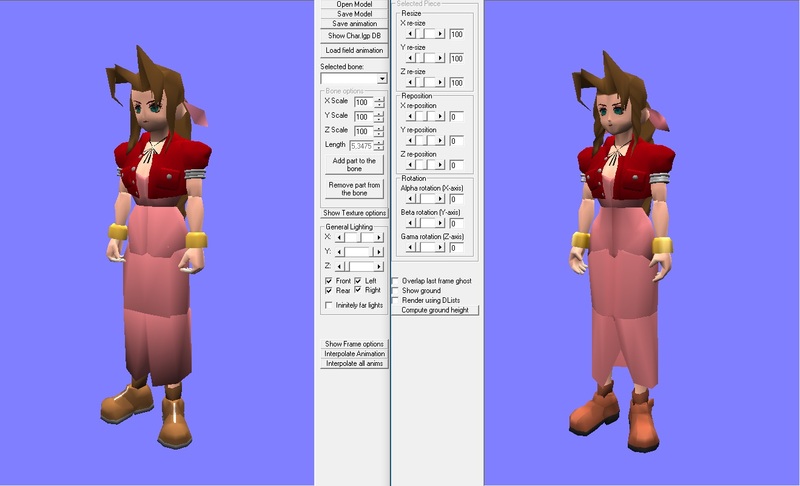 Every Kaldarasha model option in the 7th Heaven Catalog (Final Heaven is the name of the tutorial) are from this, yes. 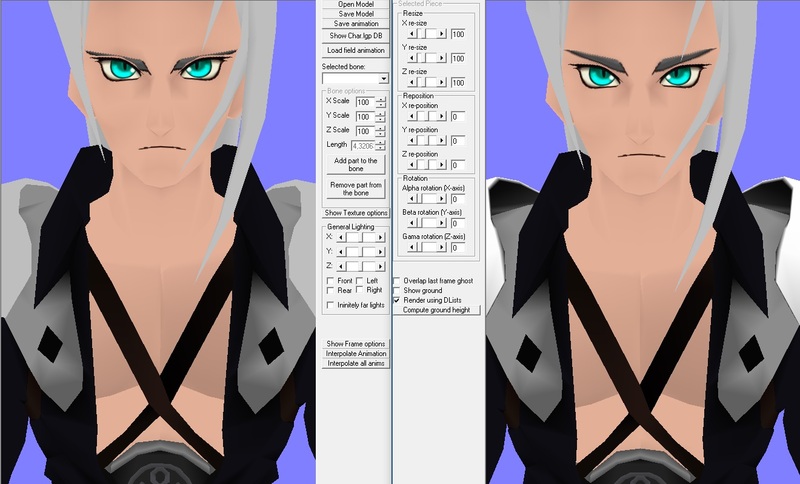 So the re-animation of Sephiroth takes longer than I like. I was bored and I always wanted to fix his eyebrows, which is why I rearranged the texture. So far I decided to bring the model workable for the first Nibelheim scene to see how good or bad the new skeleton will look in motion. For now, I will simply add the coat to the upper body won't be a perfect solution, but I guess it will look better as it does now with the silly coat pieces attached to the leg bones. Tested it, looks good so far. I imagine attaching them to the hip bone will probably give you near perfect results. No, the hip bone is rarely animated so the legs will clipping trough the coat much more and it will look very static. So far I only found a few scenes with animations which does look strange with my method. Most times sit animations. But the grow of his animations look much better this way. It's not as perfect as it would be with the new skeleton I made for him, but it is damn close to it. Your new battle-models are epic! Even your old ones are as i found the UMC2.1 on my computer. I am talking about the battle-models which i feel are exactly like the ones from the cinematics. And i always wanted them to be! One thing though, why aren't the field-models of the same quality? I'd prefer the battle-models in the field also. And lastly, do you have a download link to new models as i only have the 2.1. That version includes the main characters and soldiers in battle - but i would want Sephiroth and others. Thanks in advance. By the way, i need raw-material as i am an old-school Bootleg user. 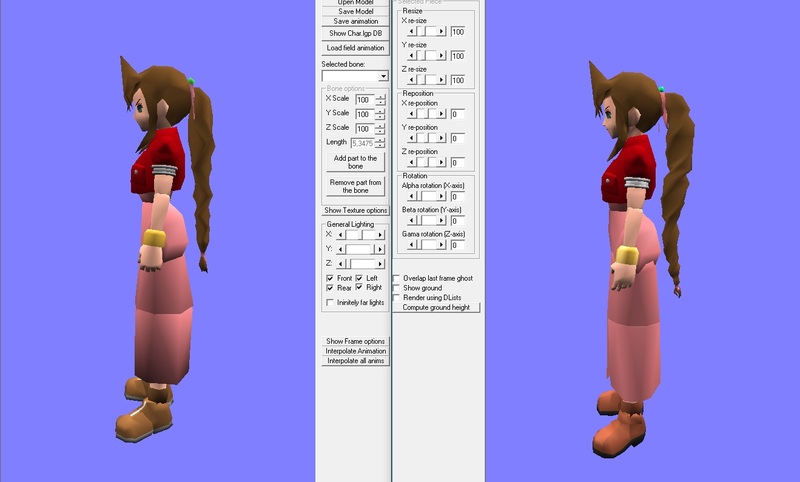 Edit: The ony bad thing that i would change regarding your battle-models is Tifa - she has "hanging breasts" when they should be round and big as in the cinematics. That's the only part i didn't like. Cheers! This is a stand alone version since sorting and patching the other models is an absolute time consuming process right now. And here he is the Chosen One. BTW: have you ever seen that scene? Excellent work Kal! I love your field models, they're my "go to" for overall field models when using 7thHeaven. Nice! And no, havent seen that scene like that I don't think.